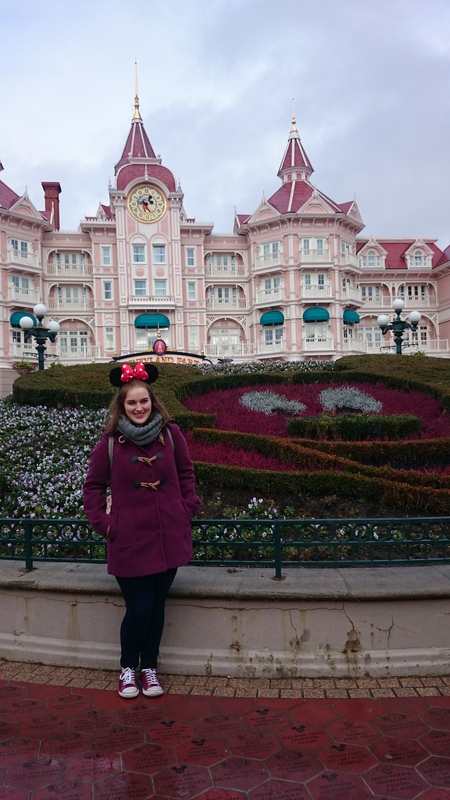 When we were in Paris for the weekend we couldn’t not go to Disneyland for a day. 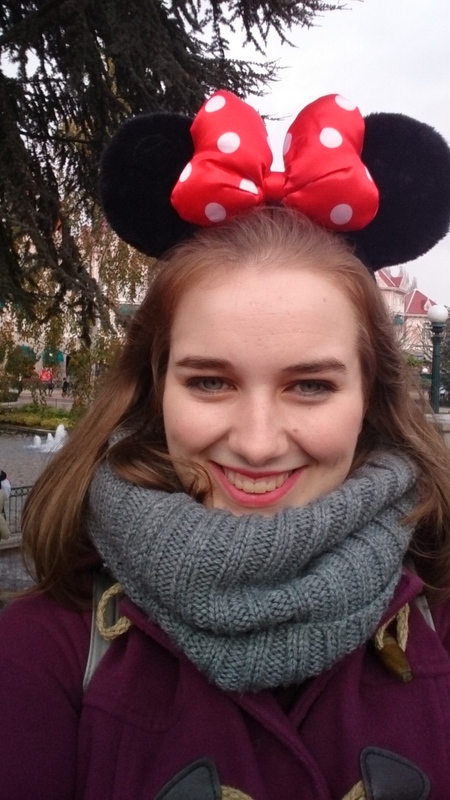 I have been to Disneyland Paris twice before but I love it and could probably go every year and not get bored. 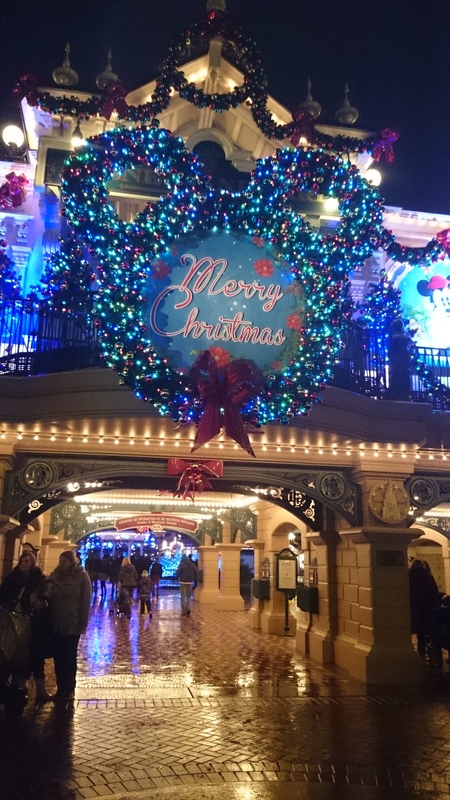 I had never been at Christmas so I was really looking forward to seeing all the decorations and lights and I surely was not disappointed , because for a place that usually feels magical it felt ten times more magical with its Christmas decorations. Our day started with a walk to the metro station to get the train all the way to Disney which only took about an hour which was very handy. Once we arrived of course the first thing we had to do was buy some Minnie Mouse ears to set us up for the day. We had already bought our tickets so it was straight into the park. 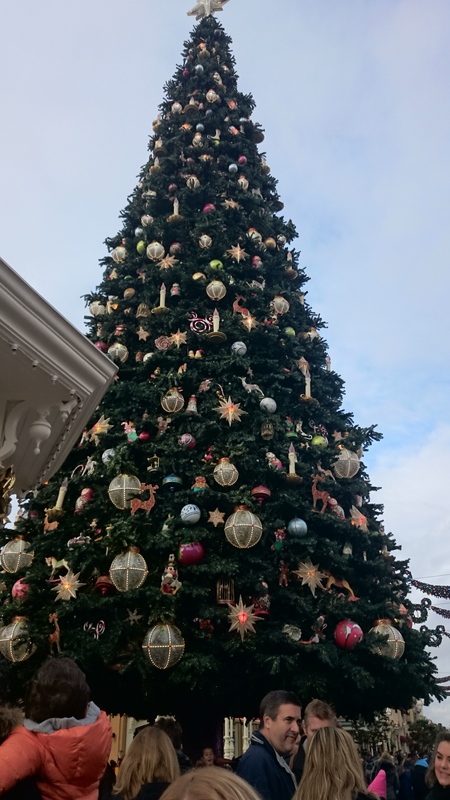 As soon as we came through the gates the first thing we saw was the Christmas tree towering over us which was amazing. 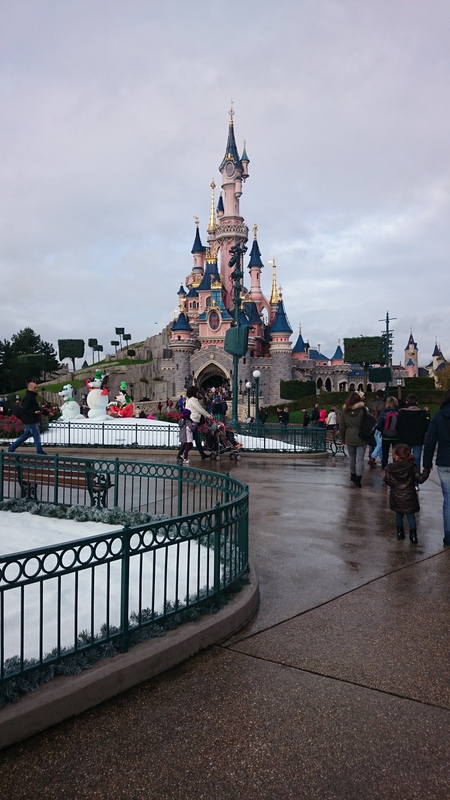 A short walk down Main Street USA brought us face to face with Sleeping Beauty’s castle which was so beautiful especially with the fake snow on the grass in front of it. Then came the princess parade which we had front row seats for and were probably more excited for then some of the younger children. After this it was on to explore the park and go on all of the rides. You can’t go to Disneyland and not go on the Mad-Hatter tea cups. Spinning and Spinning around in tea cups is more fun than you think , making it go faster and faster until you feel dizzy. Next to It’s a Small world, where the song get stuck in your head for the rest of the day (it’s a small world, it’s a small world..) but it was a nice relaxing ride until we went onto the proper roller-coasters. After a short break to re-fuel we headed to Adventure Land to go on the proper roller-coasters. First came Thunder Mountain which was great fun speeding around the tracks in little wooden carts, going and down and side-ways. This was not scary but gave you a great burst of adrenaline as it was so fast! Next it was on to Indiana Jones and the Temple of Peril which was probably my favourite ride. At this stage it had started to rain slightly so the queue was only like 5 minutes long which was prefect. At first we just thought it was going to be the same as Thunder Mountain until we read the sign telling us about the 360 turn. Two of the girls decided ‘hell no’ that was not for them so it was just two of us left to go on this ride of doom but actually it was so much fun. The 360 turn came quite early and the ride was so fast it was over in a flash. This was the first time I had ever gone on a roller-coaster with a 360 loop and I have to say I would do it again, it was such a rush. We went on some of the other rides in Adventure Land such as Phantom Manor and Pirates of the Caribbean which were great. We headed to go on Space Mountain which has another 360 loop but I was the only one who wanted to on it so I said I would go back a little later. Unfortunately when I went back it was temporarily closed so I guess that’s just another excuse for me to go back to Disneyland again. Of course when in Disneyland you have to take a look at the shops. We wandered around looking at all the cuddly toys and Christmas decorations. I bought a key-ring to remind me of the trip and my friends bought some things too. 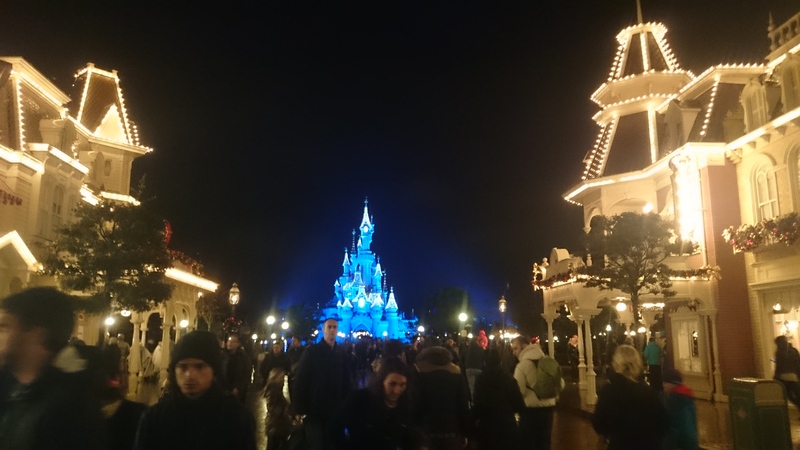 After this we saw the lighting of the big Christmas Tree was so so magical with the carols in the background. By this time it was raining and cold and the light show we thought was at 7pm wasn’t until 10pm so two of my friends decided to call it a day and head home. I decided to stay along with one of my friends as we were allowed to go out of the park and come back in later. 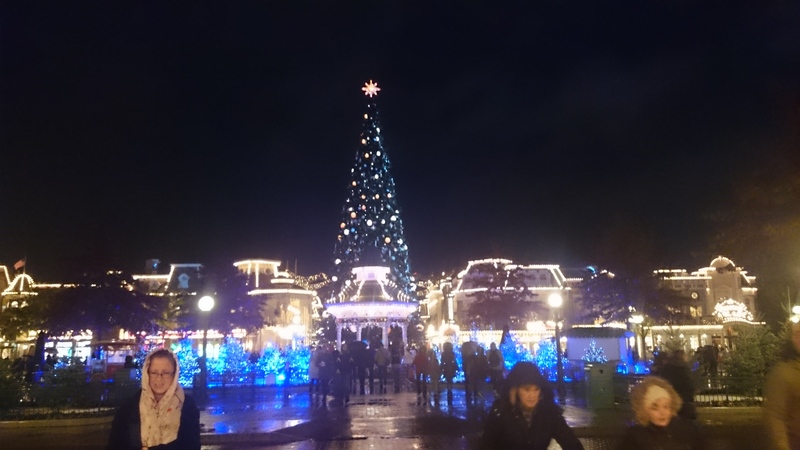 We headed to the Disney Village to get some food and a hot chocolate to warm ourselves up as we waited for the main event. 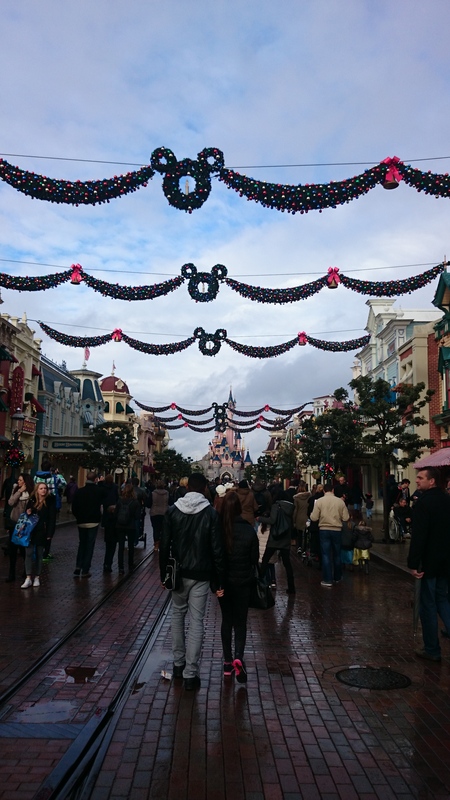 On the way back to the park as we walked through the Disney Village we had a little sing and dance to Taylor Swift’s ‘Shake it Off’ as it was blaring through the speakers on the street. We were so excited and eager to see the main event. Now I have been to Disney in the summer and have seen the fireworks show but this was something else. 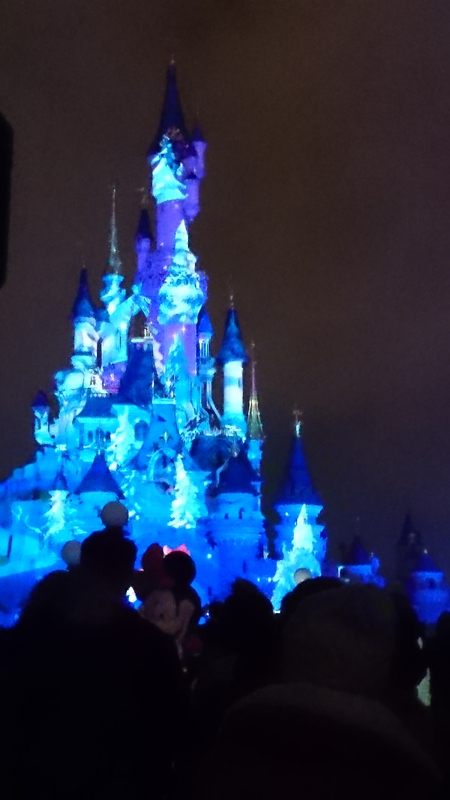 A light show was reflected on to Sleeping Beauty’s castle with all of your favourite Disney characters notably Olaf from Frozen. 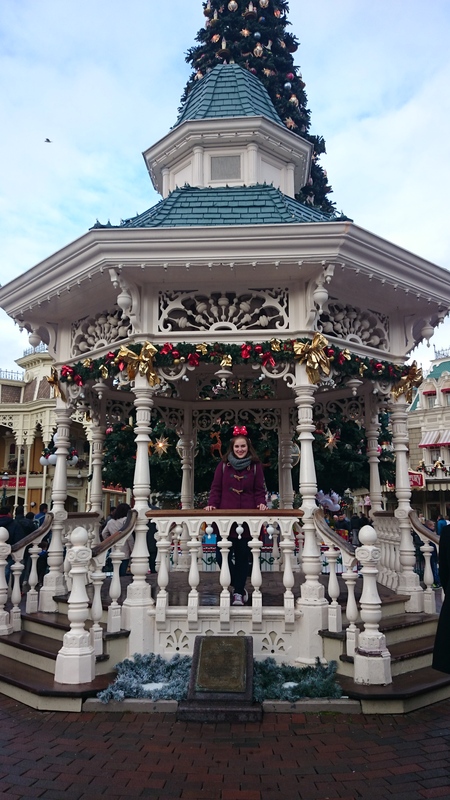 As we danced and sang our hearts out to ‘Let it Go’ I’m sure the people behind us where very amused with our acting skills but we were just having the most amazing time and were letting go as the song says. I actually think we were probably the most excited people there as bopped away to the various Disney songs. All too soon it was over and we had to get on the train back to the hotel after the most wonderful day. 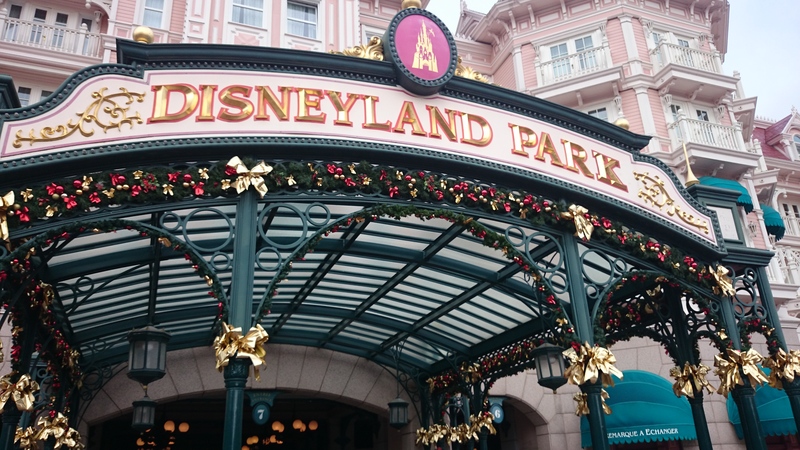 I have to say if you ever get the chance to go to Disneyland at Christmas or any-time at all, you should seize it. It is truly a magical place where your inner child can be released. I am so jealous !!! !